Aperture: Why You Care | Stop Shooting Auto! At this point, we know that aperture is how big the opening in the lens is when you take a picture. We know that big numbers mean a small opening (and therefore less light getting in), and small numbers mean a large opening and more light. f/4 is a large aperture, which means lots of light. f/16 is a small one, and only a little bit of light. Aperture does way more than control how much light gets into the camera. Those “f-stop things” are one of the most useful tools in photography. Let’s look at why. I stopped at a park on the way to work this morning so that I could take pictures of flowers to use as examples in this lesson. The flowers weren’t particularly remarkable, but they were useful patient subjects. Here’s one example. 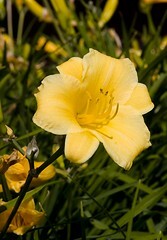 You’ll probably look at it and think, “Yeah, a yellow flower”, and see it as fairly messy and uninteresting. That’s because it is messy and uninteresting and an entirely unremarkable picture. Its purpose in life is to serve as a bad example, and it does a rather fine job of it. Here’s the exact same flower from the exact same angle, but it’s a much more compelling photo. When you look at it, your eye is drawn to the flower, and it isn’t distracted by all the stems and leaves and junk and crap and ick in the background. The only difference between the two images is that in the first one the background is in focus, and in the second it’s soft and blurred. It’s easy! All you have to do is pay a little bit of attention to what’s going on, and change your aperture to get the effect you want. It’s time for me to demystify another technical term– this time, it’s “depth of field”. Depth of field is really just how much of your image is in focus. There’s a lot of complicated stuff underlying it, but the basic premise is really simple. When you take a picture, it’s almost always true that some things in the image will be close to the lens, and others will be farther away. The way depth of field works is very simple– if your lens is very wide open (i.e. small f-stop numbers) only a narrow range of distances will be in focus. If your lens has a very small aperture (a big f-stop number), then a very large range of distances will be in focus. Confused? I don’t blame you. Let’s have our six-year-old draw us another picture. Imagine that you’re walking through a meadow. 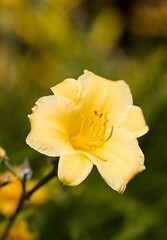 In front of you is a yellow flower. A little bit farther back from the flower is the goofiest-looking tree you ever did see, and in the distance is a snow-capped mountain range. 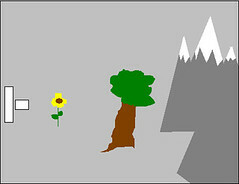 Clearly, the flower is very close to your lens, the mountains are far away, and the tree is somewhere in the middle. Let’s pretend that you’re going to take a picture of this idyllic scene, and you decide to focus on the tree. If you keep your lens wide open, the tree will be in focus but the flower and the mountains will be blurry. If you use an aperture that’s in the middle of the range then you can get the tree and the mountains in focus, and if you use a very small aperture then you can get everything in focus. The former might be useful if you wanted to focus on one thing (say a person standing in front of the tree) and the latter is great for landscape photography. Think of your depth of field as a stripe that is centered at whatever you focused on. Whatever is inside the stripe will be in focus. If your lens is wide open, then the stripe will be very narrow. If it has a very small aperture, then the stripe is very wide. I’ll close today with two excellent illustrations from the nature photography of Joe Decker. One shows the power of a shallow depth of field, and the other illustrates what a wide depth of field can do. I highly recommend clicking through to see larger images, since the thumbnails don’t do them justice. Oh, and Joe’s flowers are much better looking than mine. You’re probably still confused by this, and I don’t blame you. In the next lesson, I’ll leave the fluffy flowery examples behind and show you depth of field in a completely different way. If you don’t want to wait, stick your camera in aperture priority mode and take a bunch of pictures at different f-stops. The wonderful thing about digital photography is that you can play around a lot. The feedback is cheap and very fast. I’ll break that down. First, Canon zoom lens is obvious– it’s made by Canon, and it has a variable focal length (zoom) rather than fixed. EF-S is the type of Canon lens mounts. It doesn’t matter much for your question, but it means that you can only use the lens on cropped-sensor cameras, not on full-frame sensor cameras like the 5D. the (circle)58mm part means that the lens uses a 58mm filter. I just looked at the specs for the Quantaray 70-300, and it looks like it’s f/4.0-f/5.6. That means that at 70mm you can go as wide as f/4, and at 300mm you can go up to f/5.6. If you want really shallow depth of field, there are some things you can do. One would be to buy a new lens. For an excellent Canon lens at a low price, I recommend the 50mm f/1.8. It’s a fixed focal length lens, not a zoom, but f/1.8 will get you a very shallow depth of field. An even cheaper solution is to move closer to your subject. It’s not as good as having a lens that has a fast aperture, but it will help with background blur. the range of the f is within 3.5 – 5.6 , and both are independent. So I have been wondering why can’t I have the setting of 55mm f/3.5 ? It’s hard to really give a “why” explanation to this without getting into the nuts and bolts of lens design, and I’m not qualified to do that. In general, the focal length of the lens and the aperture of the lens are independent of each other when you’re using them. You can set the lens to f/8 at 18mm, then zoom to 30mm and change it to f/11. However, the one place where this sometimes doesn’t apply is when you’re talking about the maximum aperture of the lens– the widest it can possibly go. At 18mm, it only takes a 5mm opening to get f/3.5. At 55mm, it would take a 15.7mm opening to get that. Now think of those numbers in terms of the width of the lens barrel, and the size (and cost) of high-precision pieces of ground glass required to make a lens opening that wide. The kit lens is physically very small, which means it can be made inexpensively. In order to get f/3.5 at 55mm the lens would have to be physically much larger, and cost more to make. There are lots of lenses out there that have constant max aperture through their entire focal range. That’s because the lens manufacturer has worked pretty hard to change the size of the maximum opening at shorter lengths such that it all remains constant when you use it. I’m not sure if this helps or not. It’s really a hard thing to explain, but once you get it you’ll have an “aha!” moment. That was a great aperture/lens explanation, thank you! Sharon, look at the EXIF data on the images, and figure out what shutter speed and ISO you were using. Most likely, the problem was that your shutter speed was too slow. I’m going to guess that you were using an ISO of about 100 or 200. If so, try setting it to 800 or 1600 (or higher if your camera can) and see if you can do better. That will let you use a faster shutter speed to freeze the motion. I understand the depth-of-field, but how will I know what is going to be in focus in front and behind my subject. Is 5 feet in front of the subject in focus while 15 feet behind it is also in focus at say f/11. Check out this online depth-of-field calculator. You feed it information about your lens, distance to subject, etc. and it calculates your depth of field for you. One thing to know is that one third of your depth of field will be in front of your focus point, and two thirds will be behind. Yes, that’s exactly right! Write those two sentences on a card and put them next to you while you go play around with the camera and try different apertures. It won’t take very long at all before you no longer need the card– it will all just become second nature. I’m not an expert in dSLR video– I’ve never used it except to play around. I believe that Canon dSLRs allow you to shoot video in manual mode, though. So could you shoot video at a constant f/16 or f/22 and get most of the scene in focus? I think so. The downside is that you will need a ton of light in order to pull this off. It will also be easier if you’re shooting with a wide-angle lens rather than a telephoto lens, since you’ll naturally have more depth of field with a wide angle lens. f/11 might be a better choice. You’ll still need to focus, though. Look up “hyperfocal distance” and learn what it is, then set your lens there.